Product #2677 | SKU AT825 | 0.0 (no ratings yet) Thanks for your rating! The AT825 requires 5-52V DC phantom power, or a 1.5V AA battery for operation. A battery need not be in place for phantom power operation. Battery installation: Unscrew the upper section of the microphone body to reveal the battery compartment. Insert a fresh 1.5V AA battery in the handle compartment (“+” end up), then reassemble the microphone. Alkaline batteries are recommended for longest life. Remove the battery during long-term storage. Output for each stereo channel is low impedance (Lo-Z) balanced. The balanced signals appear across Pin 2 and 3 for the left channel, Pins 4 and 5 for the right channel. Pin 1 is ground (shield) for both channels. Output is “Pins 2 and 4 hot” – positive acoustic pressure produces positive voltage at Pins 2 and 4. Locating the AT825 nearer the sound source enhances the width of the stereo image, while decreasing room ambience. Conversely, as the mic position moves away from the sound source, a narrower left/right stereo image results and more of the “room sound” is noted. The high sensitivity of the AT825 assures useful output and an excellent match to most inputs. However, the microphone’s high output may overload some sensitive electronic input stages under some conditions. Many pre-amps and mixers include a mic pad or input attenuator control to prevent overload; or, use an AT8202 attenuator or equal at the input. 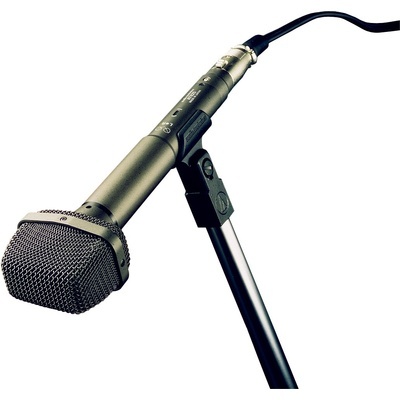 Avoid leaving the microphone in the open sun or in areas where temperatures exceed 110° F (43° C) for extended periods. Extremely high humidity should also be avoided. Maximum Input Sound Level: 126 dB SPL, 1 kHz at 1% T.H.D. Cable: 16.5' (5 m) long, 8 conductors under two shields, vinyl-jacketed, stereo cable with 5-pin XLRF- type connector at microphone end, two 3-pin XLRM-type connectors at output end. Accessories Furnished: AT8405a stand clamp for 5/8"-27 threaded stands; battery; AT8120 windscreen; soft protective pouch.